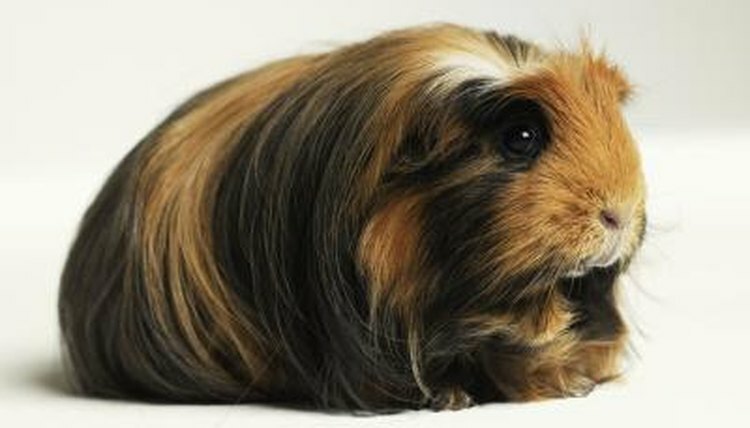 Providing fresh, clean water for your guinea pig is made easy with inverted small-animal water bottles. Install these in pairs, even if you have a single guinea pig, to provide a backup if one leaks or becomes jammed. The mounting hardware of your inverted water bottle will depend on its design. Some hang inside the cage; others connect to the outside and extend a drinking nozzle through the bars. Ensure that the nozzle is at a comfortable height for your guinea pig, around head level but not high enough that he has to strain to get a drink. Small-animal water bottles are prone to leakage, but you can minimize this problem by taking preventive steps. You may find a rubber gasket inside the cap of the water bottle; regularly cleaning the gasket may help prevent leaks. Also, make sure to fill the bottle completely every time you provide fresh water. With the bottle full, a natural vacuum forms inside the bottle and helps prevent leakage.